Just want to pop by quickly to wish all of you a very Merry Christmas and Happy Holidays and share some pics from our house and garden on this wonderful day! We didn't have a Christmas tree for many years, but this year I felt like having one again. 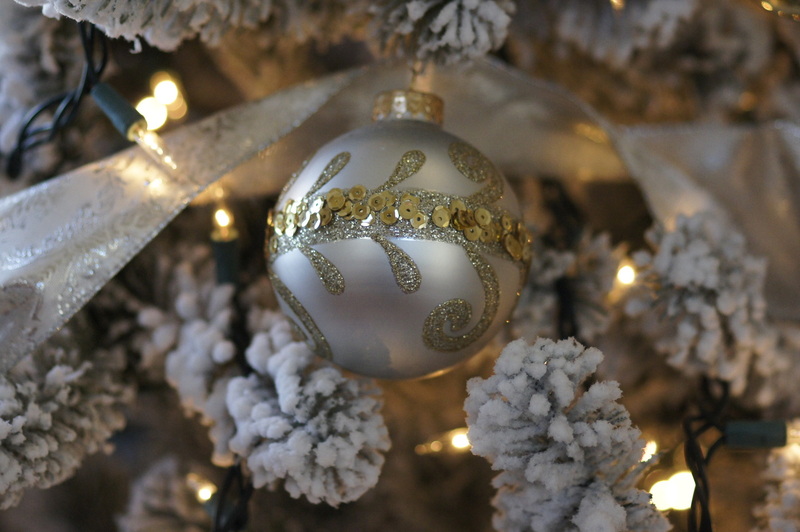 I went with a white, gold, and silver theme and tadaaaa..., here is our tree in all its glory! All our ornaments are glass and I really like the warmth and festiveness of the colors. 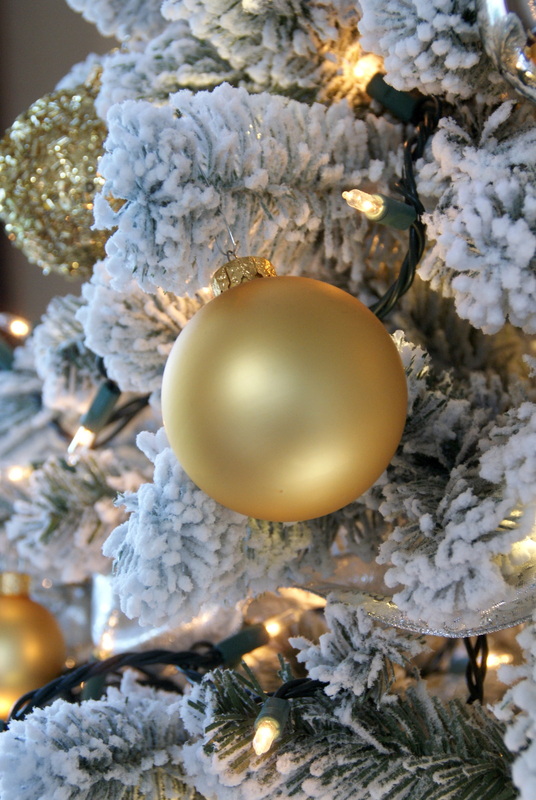 ...and simply enjoying the twinkle lights of the Christmas tree and the warm glow of the ornaments. 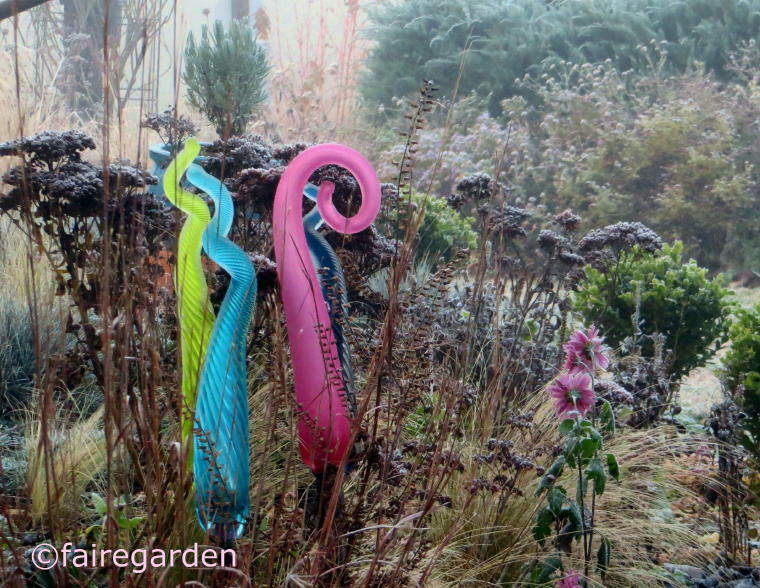 This is the view out of the window of our dining room on a foggy cold morning. This is as close to a white Christmas as it gets here in Southern California. 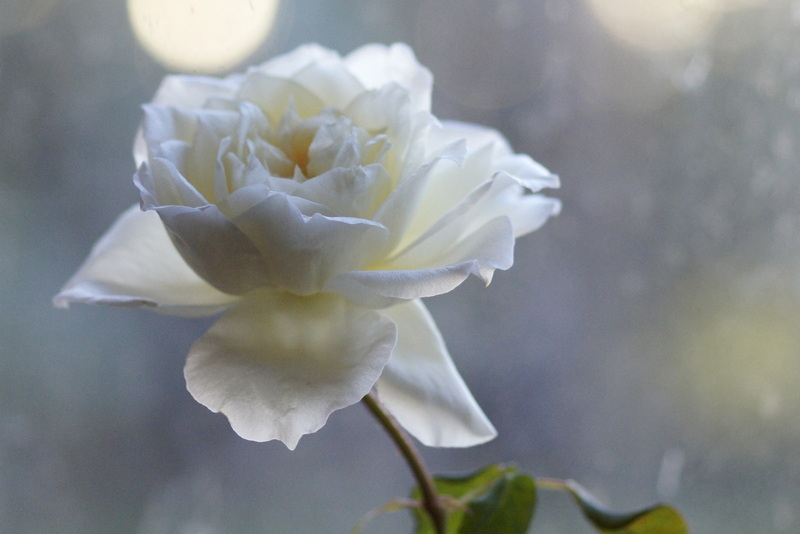 Instead of a big bouquet, we are having just one single white rose to beautify our house, but this rose is so special and precious to me because it is from our own garden. 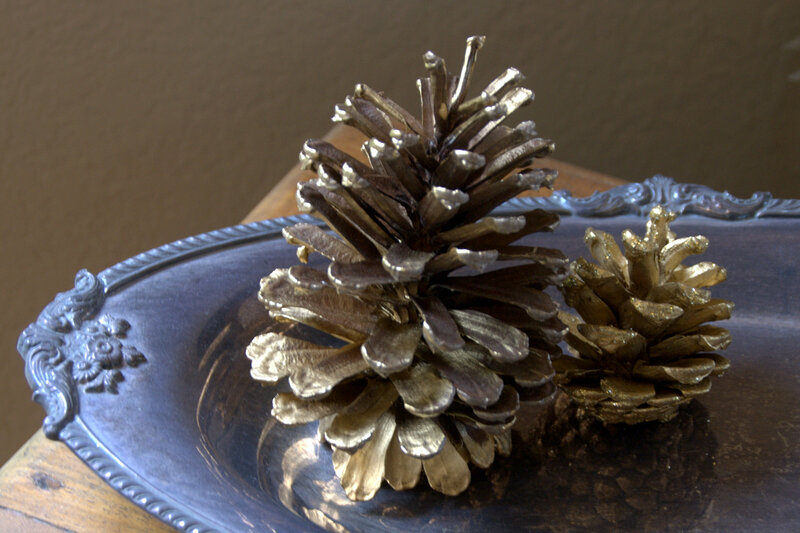 I loved adding just subtle touches of Christmas to certain areas of the house like these gilded pine cones on a vintage silver plated tray. Who needs more to feel festive? I love the "icy atmosphere" in this photo. This three tired tray, that I found for free on the street in Santa Fee, New Mexico, a few years ago, holds some pitchers of my brown transferware collection and got dressed up for Christmas with a few more gilded pine cones and silver decorative birds. Out in the garden, there are still a few roses blooming, like this soft apricot 'Chandos Beauty'. 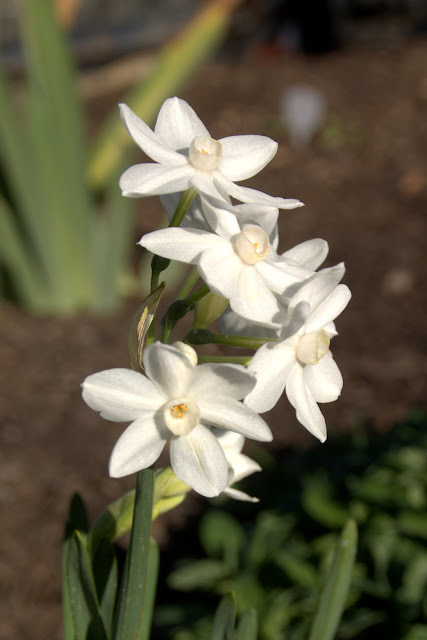 I was never lucky with Paperwhites so far, but each year I plant a few bulbs in a different location hoping for the best. Looks like I finally found a spot in the backyard that they like. 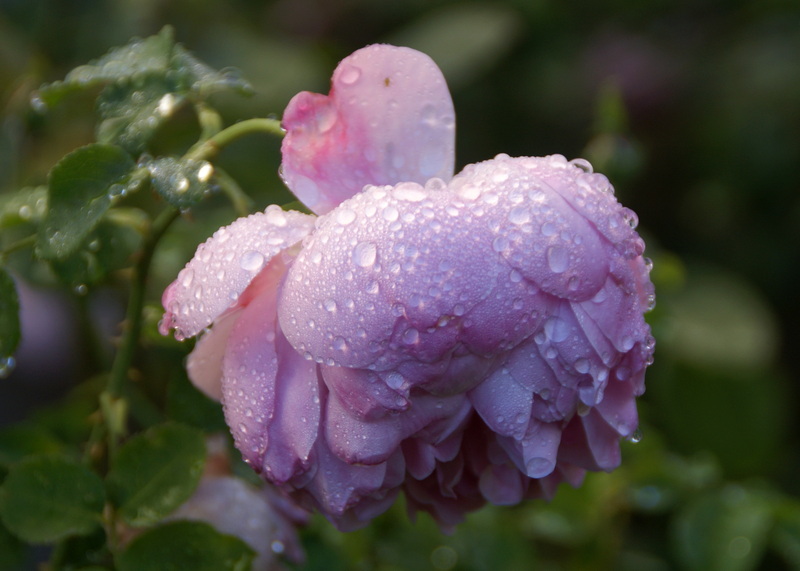 We had our first winter rain just a few days ago and the roses covered with raindrops always look so magical. 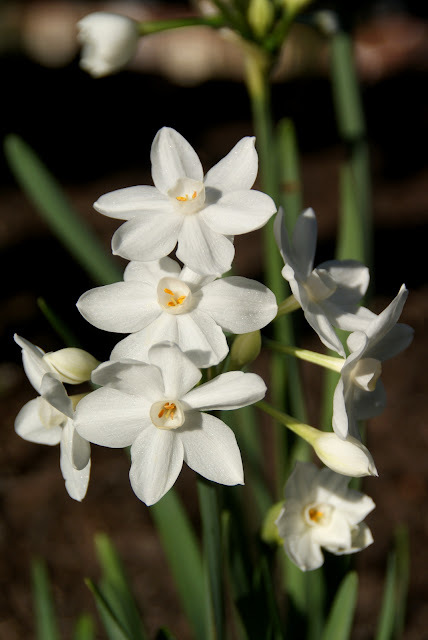 It always amazed me how strong the fragrance of the paperwhites is. Even in our low humidity it wafts and brings joy to the olfactory senses. Now, does this rose not look like clad in jewels? 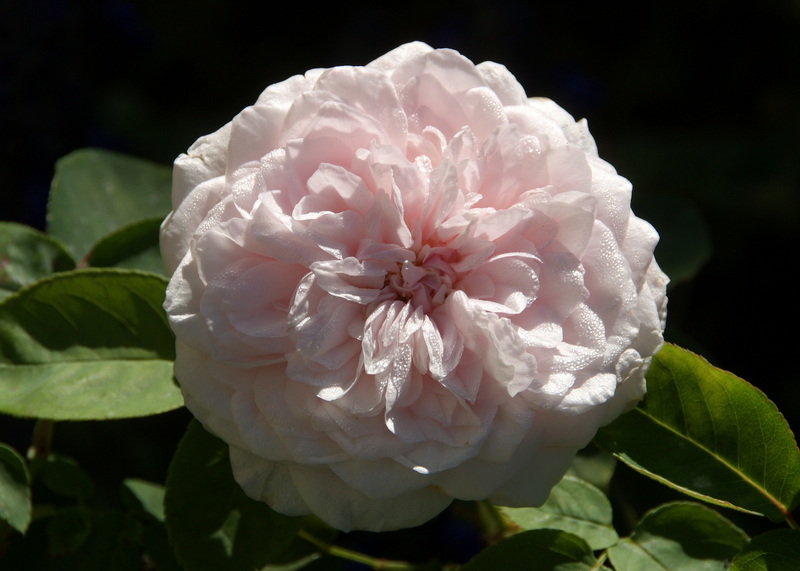 This is 'Climbing Devoniensis', a Tea Rose, which is so dear to me. 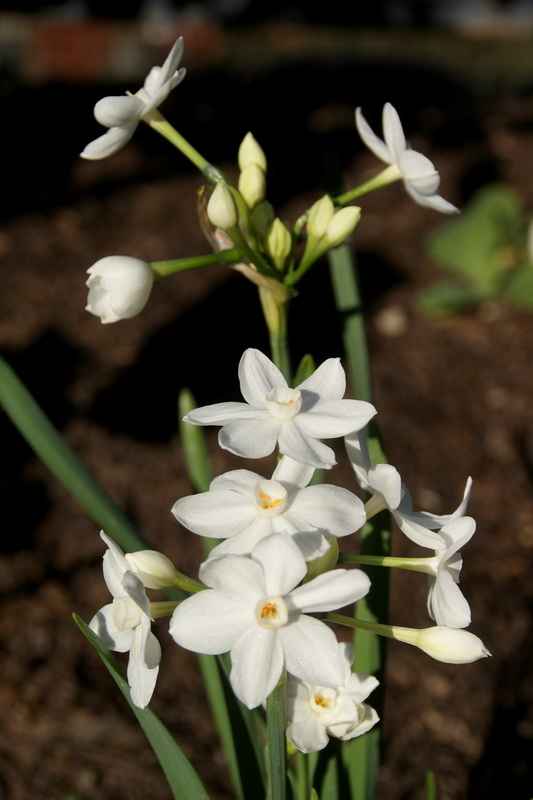 I planted only six paperwhite bulbs, but they brought me so much joy this year already. Love my roses, even as they fade away. To me, this photo captures the melancholy perfectly that goes along with the winter time. 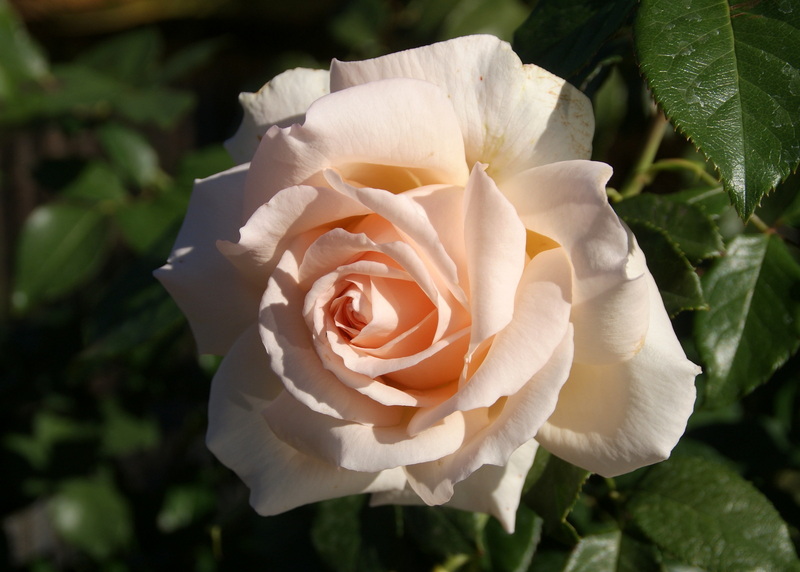 The pictured rose is 'Le Vesuve', another Tea Rose. I hope, I could convey a little bit of the Christmas spirit in our house and garden during my favorite holiday of the year to you in this post and that you enjoyed it. 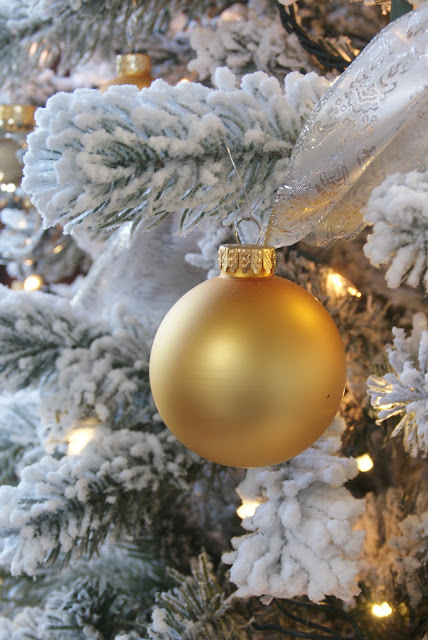 May you find some joy, peace, quiet, and happiness during the holidays! PS. If you want to see more photos from our house and garden please visit me on Instagram. Unfortunately, timewise I am not able to blog that often, but I am posting a photo almost daily there! Last month I traveled to Santa Fe, New Mexico again to attend a workshop. Let me just say it up front: I love this town. There is something special about the wide-open blue skies and the light there, no wonder many painters, maybe the most famous one being Georgia O'Keeffe, felt and feel drawn to this area. The clean air, the rugged high desert nature, the Adobe architecture are simply stunningly beautiful. Sadly, as usual, I didn't have much time to explore the town and take photos. But on my first day, I realized that I did forget to bring my house shoes and since I am always suffering from cold feet, I decided to buy a new pair. I stayed at a friend's house in one of the older neighborhoods of Santa Fe and to my surprise, I could simply walk from her house (didn't have to drive as it is usually the case here in America!) to an independent shoe store and get some there. So I took my camera with me and on the walk back and forth through this pretty neighborhood, I shot all the photos that you see in this post. Hope you enjoy them! Did I say I love the Adobe architecture, already? The organic forms of the houses and their surrounding walled gardens are so beautiful and their earthy brown color fits right into the deserty and rugged nature of Santa Fe. This house is oozing with charm and atmosphere. I could move right in. This little plant was literally growing through some cracks on the sidewalk. Its silvery blue-green color is so pretty and the fallen leaves from the trees that got caught in it just enhance its beauty. This enchanting decoration made out of all natural materials hung on my friend's wrought iron entry gate. In Santa Fe, it is common to decorate the houses inside and outside with all sorts of red peppers. These unusual seed pods caught my eye. I wonder what plant will grow from them. Spectacularly clear blue skies and another Adobe beauty. At the time when I was there, the trees had lost already quite a few leaves but the colors of the remaining ones were still mindbogglingly intense. I have rarely seen so many beautiful wooden gates, old and new, like in this town. Some are quite simple like this one and others are very elaborate, but they are always very well made. Do you see the sign saying Beware of Dog? I wish we had such a tasteful sign at our garden gate. This little aster added such a pop of color to the Santa Fean autumn color scheme. It was happily growing on the sidewalk, seemingly without much care. Another Santa Fean beauty! In this case, the landscaping fitted the house so well. The austerity of this entry spoke to me. Sometimes less is more. Do you see the bell on the right side of the door? This house and garden had a wild and quirky vibe and I loved it for its untamed nature. Another beautiful gate, pleasing in its perfect simplicity. Glowing orange berries. They were really eye-catching. An eye-catcher of a different kind. This red gate is so perfectly echoed by the red leaves on the left side of the photo and it goes so well with the earthy brown Adobe walls. Would love to enter through this white garden gate. 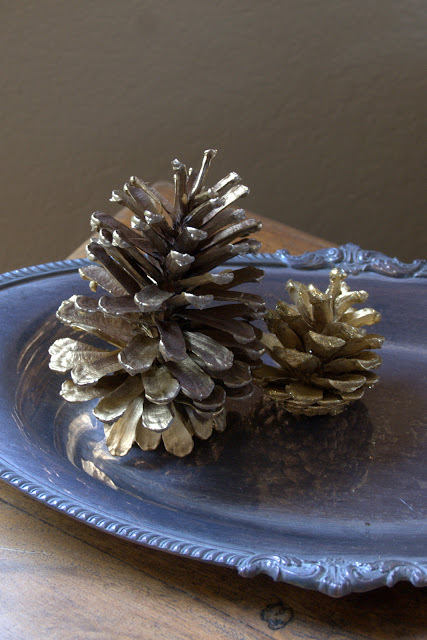 As mentioned, many artists and creative people are living in Santa Fe and they leave a very positive imprint on the town. This metal crow caught my eye because it is holding a turquoise in its beak. A little nod to the fact that turquoise was and is found in New Mexico. This gate was certainly the most colorful that I came across and the turquoise colored carpet in front of it is just emphasizing its dramatic effect. The hardware on it was so stunningly beautiful. Loved these soft, fuzzy, lavender colored flowers against the backdrop of the grasses. Blue paint faded to perfection by the harsh weather conditions of Santa Fe. 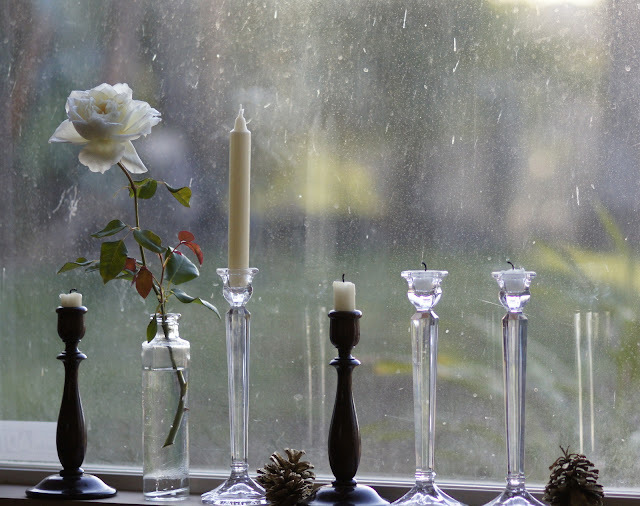 Simple and inviting. Love the stacked firelogs by the front door. Perfect gate for my taste. Who wouldn't want to walk through these doors? I didn't see many roses in Santa Fe, even though I know they are growing there. Admired the restraint of this scene. The tall cedar casts such beautiful patterns of shade on the Adobe wall. I really like the color of this tatty echinacea. Red, blue, and yellow, strong contrasting colors brought into harmony by the soothing warm brown Adobe walls. Coming full circle I am ending this post with a close up of the entry of the house that I opened it with. I always think that I could live in Santa Fe, that maybe I even would like to. It doesn't look right now that this is on my cards, but who knows what turns and twists life will take on. But at least I hope that I will visit again, soon. Next time I am really planning to take some extra time to explore this wonderful town. The Thanksgiving weekend is coming to an end here in America and I hope that if you live in this country and celebrate Thanksgiving that you had a lovely one. No matter what the calendar says, to me Thanksgiving signals the end of autumn and the beginning of winter and the Christmas season. I kinda surprised myself this year by ordering a flocked artificial Christmas tree. We stopped having Christmas trees for a couple of years because all of a sudden I wasn't in the mood anymore to do all the decorating. We were also afraid that our two rambunctious Dobermans would take the tree down when they chase each other in the house, but this year my desire to decorate came back and hopefully the dogs are a little less unruly by now. We will see. So we put up the Christmas tree this weekend. It is not decorated yet, but we strung in the Christmas twinkle lights already. The tree is lit as I am writing this post and I have to say it looks quite magical. I wonder, are you celebrating Christmas? 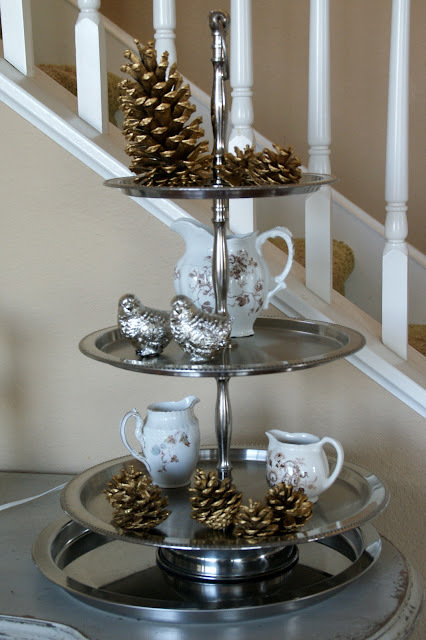 And if so have you also started to deck the halls already? In any case, I am wishing you a wonderful week ahead. 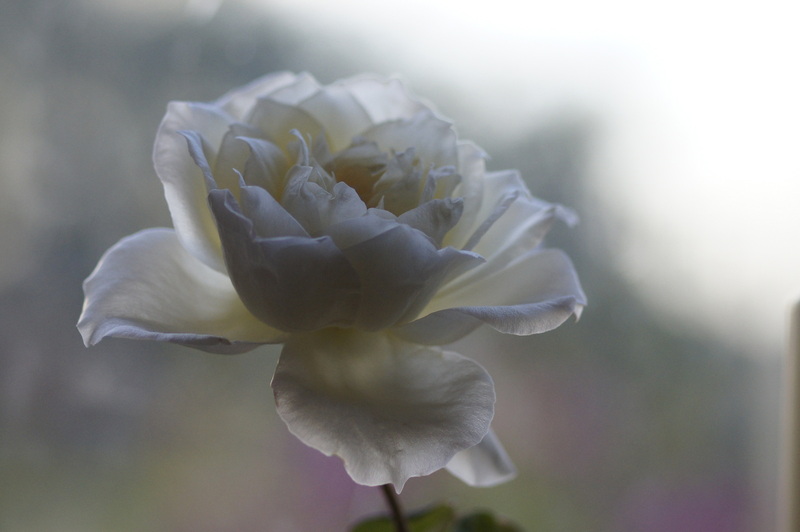 I am trying to pick up my habit to blog monthly about the roses that have bloomed in my garden the previous month. So here come my rose babies that have delighted me in September. Sadly, overall I have a feeling that I am getting less and less rose flowers over the last couple of years. I am not entirely sure why that is so but my best guess is that my roses are not fertilized enough to bloom to their full potential. 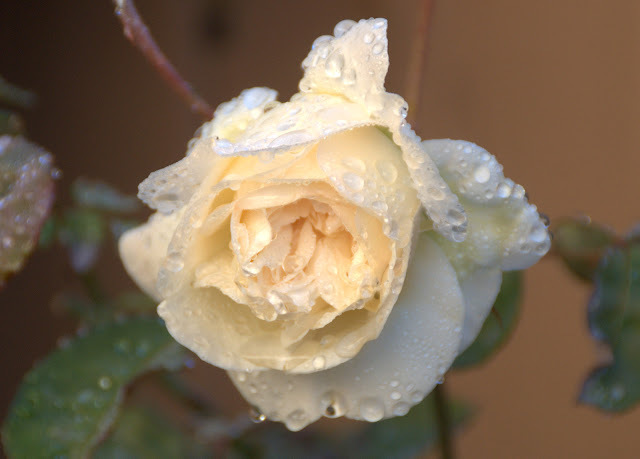 So far I have been gardening entirely organically in my San Diego garden, but usually organic fertilizers are not as potent as the synthetic ones and I have not had the time to fertilize my rose on a regular schedule, which means a couple of times a year. Therefore I have decided as an experiment, to feed them the same amount of organic fertilizer that I usually do, but in addition to that add a scoop of synthetic slow-release rose fertilizer and see if that makes a difference. This decision was difficult for me because I am convinced that organic gardening is the best way to go when it comes to the environment, but I became so frustrated with the few rose blooms that I got lately, that I simply couldn't stand it anymore. 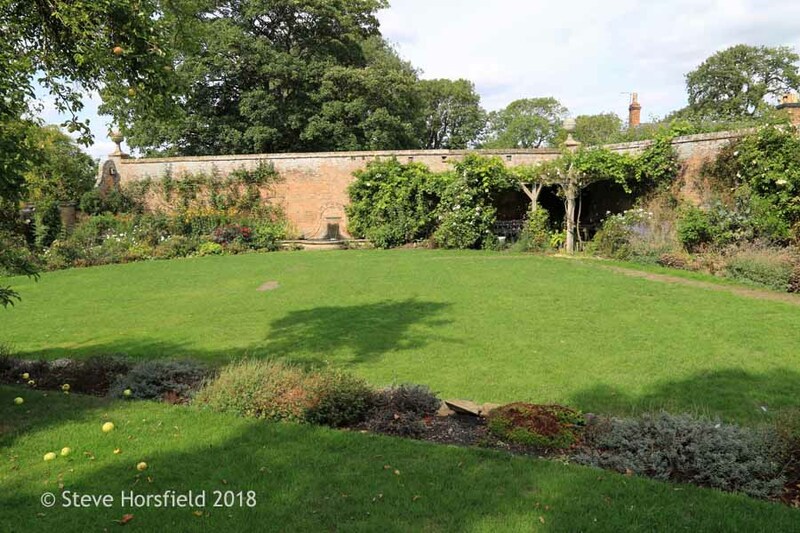 Otherwise, my garden will continue to be no-spray and I will use the synthetic fertilizer very responsibly, meaning using as little as possible. That being said, I hope you enjoy to take a look at my September roses! I think rosa 'The Prince' was the most beautiful rose last month in my garden. By chance, I got lucky and for once I was able to photograph the color of this stunningly beautiful rose properly and to capture the velvety texture of the rose petals. Rosa 'Snowbird' is relatively new to my garden, but starts to get going. The blooms have a very elegant, a little bit old-fashioned Hybrid Tea form and I am liking it more and more. Rosa 'Pink Pet' is a very healthy, easy going rose in my garden with a cottagey appeal. Completely the opposite of 'Pink Pet' is the ambiance of rosa 'Neptune'. Very elegant, a diva that commands respect. I love the fact that you can find so much diversity among the roses. There truly is a rose for everyone! Even though very susceptible to powdery mildew and even black spot, rosa 'Nimbus' has won his place in my heart because of the absolutely unique color. The rose is very willing to bloom and the color is constantly changing but always in the fascinating mauve, tan, brown color range. As usual, rosa 'Our Lady of Guadalupe' is blooming her head off, but even though it is a very floriferous pretty rose, I have decided to take my last specimen out. 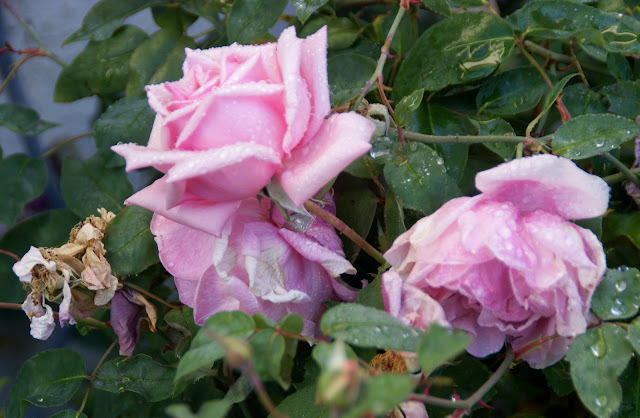 I just don't want to put up with its very regular infestations of powdery mildew anymore and believe that I can find a healthier floribunda rose in the light pink color range. Rosa 'Rhodologue Jules Gravereaux' is my most favorite Tea Rose. I think it is also one of the most elegant roses in this class. 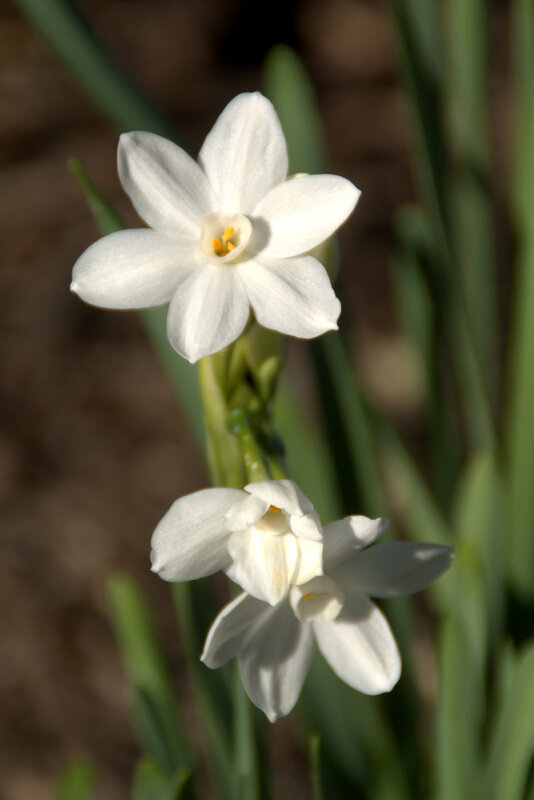 Look at the beautiful shape of the buds with the unfurling outer petals. Just magical! Rosa 'Pope John Paul II' is almost an old standby in my garden. The blooms are very pretty, it gives me four to five good flushes a year and the fragrance is to die for. I wouldn't want to be without it! 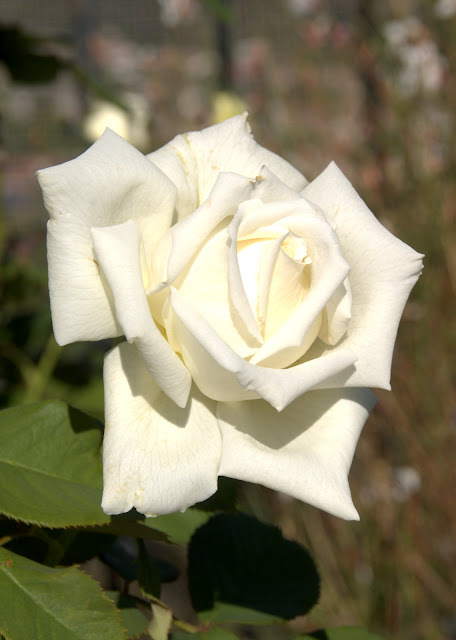 The classic Hybrid Tea rose bud of 'Bewitched' certainly is enchanting. 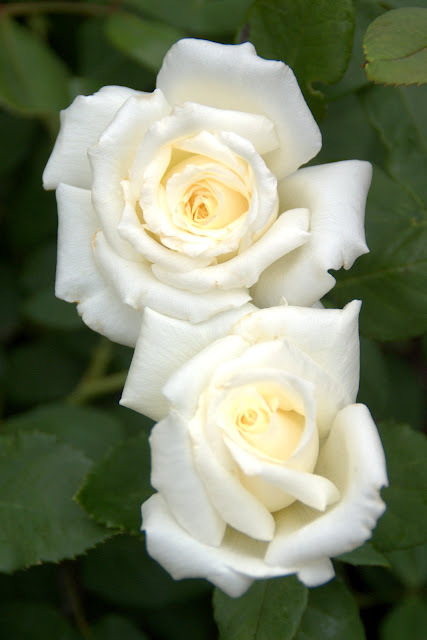 When you see this rose, you can understand why most people favor Hybrid Tea roses above all other rose classes. A second flower of 'Bewitched', this time a little bit more open. Another diva in my garden, rosa 'Souvenir de la Malmaison'. This rose has died on me once already and this specimen was also very close to death at least two times. But it survived so far and the extraordinary beauty of the blooms keeps me trying to get this rose established in my garden. I end this post with a look into the heart of 'Nimbus'. The color gets me every time. So special! 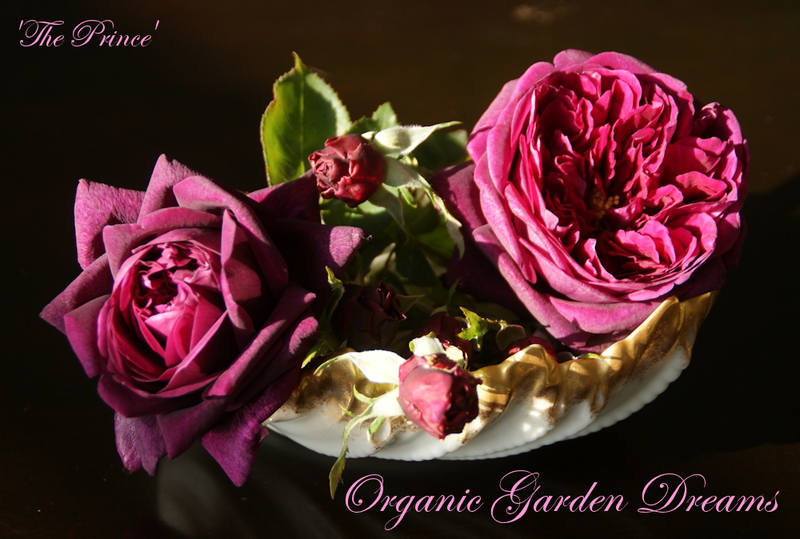 Are you still able to enjoy roses from your garden? Do you have a favorite rose right now? I just want to mention, that even though I can't find the time to blog very often, I am posting almost daily on Instagram. If you want to take a peek, just click on the link. I would be happy to meet you there! Wishing everyone a nice rest of the week and a very enjoyable weekend!